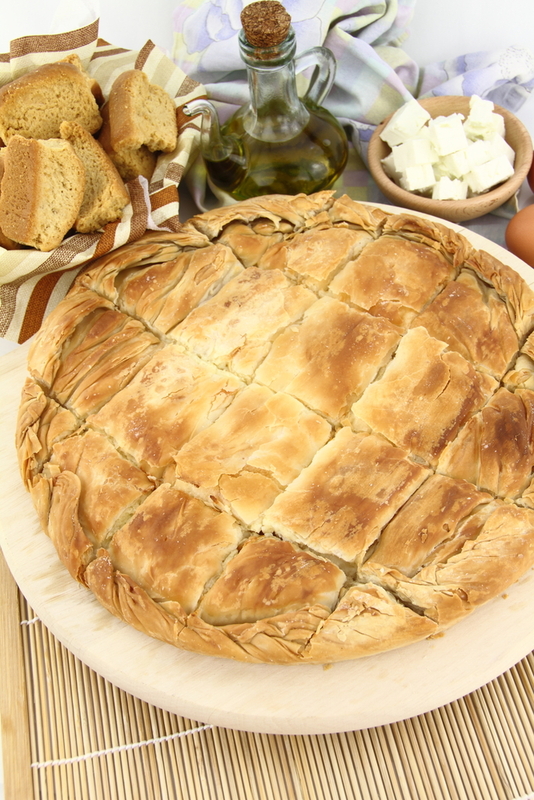 Savory pies are more than common in Greek cuisine. In fact, they are a staple. The most famous is the cheese pie, the one that we prefer mostly as a street food. Everywhere, at every corner of our cities and towns, you can find a “tiropitádiko”, which is basically a small shop with no tables to sit, and where you can be a cheese pie or other kinds of pie and eat them as a street food. As a matter of fact, many Greeks prefer them as a part of their breakfast on the foot –something that we are very used of. There are many variations of the cheese pie. To be honest every region has its way of making it. The pastry can differ, the mixture of cheeses can differ as well. Basically feta cheese is used but there can be differences in the quantity used, sometimes it’s the prominent cheese in the pie, sometimes it’s not. The recipe we’ve got today is one of the most common ones. Easy to make and so delicious that there’s no doubt you’ll be making it again in no time! Defrost the puff pastry at room temperature. In a large bowl crumble very finely the feta cheese with the aid of a fork. In another bowl whisk the eggs. Add the milk, salt and pepper and whisk again. Add the egg mixture to the cheese and combine thoroughly. Use a brush to grease a baking pan with some olive oil. Lay one sheet on the bottom. Pour in the filling evenly and cover with the remaining sheet brushing it lightly with olive oil. Brush the top of the pie with the beaten egg and score the dough into 12 pieces. This entry was posted in Around the Greek table, FROM GREEK HOMEMAKERS / and tagged comfort food, pies, street food on 10 February, 2014 by George Papageorgiou.